The struggle to keep unconventional gas and oil development (UNGOD) out of New Brunswick is a story filled with many actors, heroes and organizations, each playing important and vital roles. However, for many of us involved in that struggle, the seeds for our victory were largely sown by a single person – Stephanie Merrill, the Water Specialist at the Conservation Council of New Brunswick. What follows is our special tribute to Stephanie, who is now heading out to share her expertise with the Global Water Futures program at the University of Saskatchewan. Buy Local for Thanksgiving: We’ve got an app for that! At the height of the harvest season and just in time for Thanksgiving, the Conservation Council of New Brunswick is releasing its new, free BuyLocalNB™ smartphone app! Our user-friendly app helps you find delicious and wholesome locally-grown meats and alternatives, fruits, vegetables, grain products and more — all grown or produced right here in New Brunswick! Looking to prepare a local-infused Thanksgiving feast with all the fixings this year? Use the BuyLocalNB™ to source your ingredients within minutes. But it’s not just for local food! Looking for furniture with that authentic, hand-carved feel? Or are you on the look-out for a thoughtful gift idea, like the perfect hand-made artisanal craft? Maybe you want environmentally-friendly cleaning supplies or soaps? The BuyLocalNB™ directory has it all, and our new smartphone app puts everything right at your fingertips. We also want to help you experience the local food economy through our smartphone app. Use the ‘Visit a Farm’ feature to find a local producer near you — maybe a sugar shack, apple orchard or dairy farm — and arrange a first-hand look at what they do to provide our families with fresh, wholesome, local products. You’ll also find the dozens of farmers markets and local markets adding life and vibrancy to our communities. The BuyLocalNB™ initiative launched at the Conservation Council in 2009. In 2011, we developed an online local food directory that became and instant favourite of local foodies, with chefs and retailers using our directory to source their products and ingredients. We revamped our online food directory last fall, adding a user-friendly searchable database of local growers, producers and retailers. Today, the online directory and complementary smarthphone app feature more than 280 local farmers, craftspeople and businesses, with more becoming listed each day! 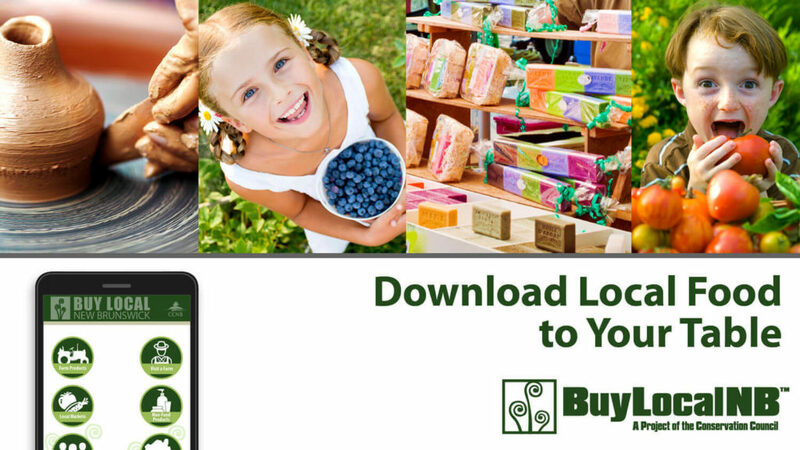 Get the new BuyLocalNB™ smarthphone app to download local food to your table today! CCNB Action needs your help to distribute our “Vote for Our Forest” cards. The cards, available in English or French, include 4 questions that you can ask the candidates seeking election in the next provincial election on Sept. 22. The cards can also be displayed in your window or door to show your support for our forest. 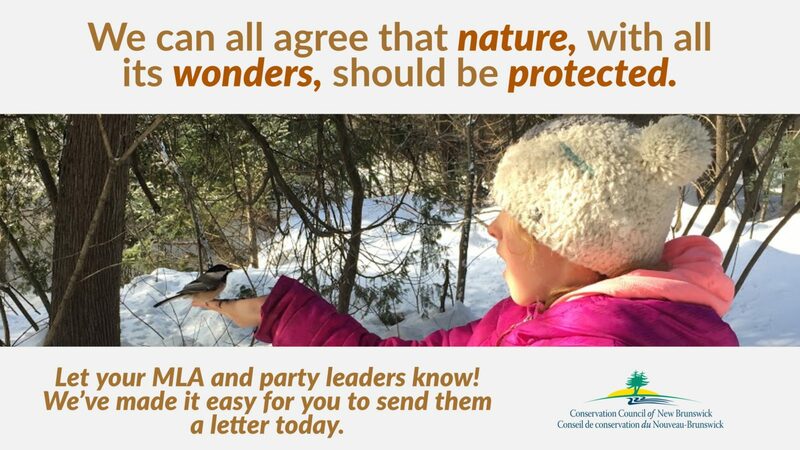 To get copies of the cards, email Tracy at forest@ccnbaction.ca. To view the English card, click here. Fredericton – The Conservation Council of New Brunswick will present its annual Milton F. Gregg Conservation Awards in Fredericton on Saturday, April 27th. The award for lifetime achievement will be presented to Alma Brooks, a Maliseet grandmother and long-time activist for the Wulustuk River, also known as the Saint John River. Charles Theriault who uses the power of film to engage New Brunswickers on the threats facing our forest and people will receive the award for environmental activism. The Taymouth Community Association will be recognized for their organization's work over 10 years since they purchased the community school and transformed it into a centre of community capacity building, local economic initiatives and social cohesiveness. The recipients will be honoured on the evening of Saturday, April 27th at the Conservation Council's annual fundraiser and awards nights. This year, CCNB is excited to announce an Eco-Soirée with popular Acadian indie-folk trio, Les Hay Babies. The special event will be held at Memorial Hall, UNB, Fredericton, beginning at 7:30pm. The Gregg Conservation Award winners are selected by CCNB's Board of Directors from nominations submitted by their membership. The Milton F. Gregg Conservation Awards have been presented annually by the Conservation Council since 1981. Tickets to the event are available for purchase online, at Conserver House (180 Saint John St, Fredericton), Westminster Books, True Food Organics or by emailing forest@conservationcouncil.ca. FREDERICTON — The Conservation Council of New Brunswick has partnered with Earth Day Canada to help New Brunswickers make eco-friendly choices this April 22 and beyond. The province's leading environmental organization will be supplying free materials to schools and teachers and providing event toolkits for groups or individuals looking to organize local events across New Brunswick. The Conservation Council is the official N.B. partner of Earth Day Canada and one of several groups collaborating on the campaign across the country. The theme of this year's celebration is 'Clean Your Commute,' encouraging Canadians to become VGPs — Very Green People — by embracing green transportation options on April 22. Other elements include the 'Earth Day Every Day Campaign.' On April 22, Canadians who signed up will receive an 'Earth Day Every Day' toolkit that will give them ideas for fun ways to reduce and track their environmental footprint over the course of the year. Organizers have also created a 2015 Earth Day Flag which will be signed by people from coast-to-coast who have committed to cutting their carbon emissions by 20 per cent by the year 2020. The flag will be presented during the International Climate Conference in Paris in December, re-creating the moment when a similar flag was presented at the U.N. Earth Summit in 1992. The Conservation Council will coordinate with New Brunswickers who want to sign the Earth Day Flag. Prizes are available for people who participate, post about, and share their Earth Day Canada activities. To receive free promotional materials, resources for teachers, event toolkits, or to arrange to sign the 2015 Earth Day Flag, contact Jon MacNeill, Communications Officer with the Conservation Council. FREDERICTON — A herbicide sprayed yearly and in large quantities on New Brunswick forests was recently classified as a probable cancer-causing chemical by the International Agency for Research on Cancer (IARC), an arm of the World Health Organization. The decision was published in the journal, Lancet Oncology. Glyphosate, sold under various trade names including Roundup, Vision, and Vision Max, is a broad-spectrum weedkiller used in agriculture, silviculture, recreational areas and on lawns. Globally, it is the highest-volume herbicide in use. The IARC panel of 17 experts from 11 countries classified glyphosateas a probable carcinogen based on evidence in human and animal studies. Several studies, including one in Canada, have found a link between occupational exposure to glyphosate and increased risk of non-Hodgkin's lymphoma. "Glyphosate can be absorbed into the body and has been detected in the blood and urine of workers handling the chemical,” says Inka Milewski, science advisor for the Conservation Council of New Brunswick. "Glyphosate causes cancer by damaging chromosomes (DNA) which can result in mutations that lead to cancer. But it is not only workers that are affected. The IARC experts cite a 2009 study that found chromosomal damage in residents of several communities after aerial glyphosate spraying." Herbicides have been used on New Brunswick forests since the 1970s when pulp and paper companies were first permitted to clearcut natural forest and replace it with plantations. About 13,000 hectares of Crown forest are sprayed each year in the province. Spraying is done by helicopter for about 40 days between August and September, covering roughly 25 per cent of the softwood land cut each year. The Conservation Council is calling for a ban on glyphosate use in New Brunswick’s Crown forest. "Health policy and regulations lag way behind the known science of many of the pollutants in our environment. There are plenty of examples where regulators have waited too long before acting to protect public health. Lead, DDT, radon, dioxin and cigarette smoke come to mind," says Milewski. Tracy Glynn, forest campaign director for the Conservation Council, says it's time for New Brunswick to ban aerial herbicide spraying in forests. "Quebec banned the use of glyphosate in forestry in 2001 and replaced herbicide use with thinning crews.Nova Scotia recently abandoned the public funding of herbicide spraying of their forest and is moving toward FSC certification of their forest, which would mean no more herbicides in their woods. But here in New Brunswick, we continue to fund silviculture on Crown land that includes spraying, which according to data from Natural Resources Canada, can cost the province about $1,000/ha," says Glynn. Three petitions, signed by thousands of New Brunswickers, against herbicide spraying in the forest have been tabled in the New Brunswick Legislature in just over a decade, the most recent in 2011. Kent County residents have recently risked arrest and are facing hefty fines for trying to stop the herbicide spraying of their woods. Attention News Editors: Lois Corbett, Executive Director of the Conservation Council of New Brunswick, issued the following statement about the Department of Environment and Local Government’s report, Working Together to Build a Water Strategy for New Brunswick - Summary of Comments, released today. She is available for comment. The Summary of Comments report documents the feedback from public information sessions, stakeholder sessions held across the province, and online and written submissions to the Department of Environment in response to the March 1, 2016, Discussion Paper, Working Together to Build a Water Strategy for New Brunswick. The Minister also announced that the Department is establishing a technical working group to provide recommendations on water classification. “The report has fairly captured the importance of protecting New Brunswick's precious water. The advice from the public, and the wealth of first-hand experience included in its pages from those working on the front lines provides a clear call to work together to produce a modern, effective and efficient water protection strategy,” said Corbett. be accountable, involving monitoring and regular reporting to the public on the progress of goals and objectives outlined in the water protection strategy. “We are especially pleased to see the Minister is committed to water classification as a critical part of an overall water protection strategy by setting up a technical advisory group. I was encouraged to see support for this and for all the other important elements reflected in the Summary Comments paper. This clears the way for the government to create a comprehensive and progressive strategy, one based in modern law,” said Corbett. Read the report, Working Together to Build a Water Strategy for New Brunswick: Summary of Comments, here. Read the original March 1, 2016, Discussion Paper, Working Together to Build a Water Strategy for New Brunswick, here. “I’m surprised by today’s announcement considering it’s been made in a vacuum. Final approval of this project is a joint process between the provincial and federal government — but we’re still waiting on the review from the feds, and there are outstanding parts of that review that we’re committed to participating in. The province also has not released the summary of the Independent Review Panel to the public, as it’s required to do by law. The summary needs to be released right away for the sake of transparency, otherwise our government is playing fast and loose with the rules that let people participate in this process. The company behind the mine proposal, Sisson Mines Ltd, is still far from securing the financing needed to move forward with the project, and no public financing accounts have been released. At best, today’s announcement is a signal that the province is open to business, but in reality, you can put lipstick on a pig, but it’s still a pig. The conditions of approval are vague when it comes to critical issues like emergency planning, the security of the tailings dam, and liability. Most striking, we’re letting the fox guard the henhouse by leaving the responsibility to protect the Nashwaak River and watershed directly in the hands of the company. Even the International Council on Mining — composed of the world’s largest companies — said yesterday that the control standards for tailing facilities are inadequate and the council would be reviewing and revising its standards. We’ve seen at least three major tailings disasters in the past year and a half — at Mount Polley in B.C., the Buenavista del Cobre mine in Mexico, and most recently in Brazil, where 16 people died and the Brazilian government announced yesterday a $5.2 (billion) USD billion lawsuit against the company responsible. Est-ce que les résidents de Fredericton pourront demander à TransCanada quels sont les risques d’un déversement de l’oléoduc Énergie Est dans leur eau potable? FREDERICTON – TransCanada refuse d’organiser une réunion publique pour les résidents de Fredericton, alors que cette compagnie se prépare à rencontrer pour la deuxième fois en un an la communauté des affaires. Kevin Maloney d’Oléoduc TransCanada prévoit faire une présentation matinale à la Chambre de commerce de Fredericton le 17 mars 2015 au Palais des congrès de Fredericton de 8 heures à 9 heures. À titre de gérant de la construction du nouvel oléoduc – Ontario & Nouveau-Brunswick, Maloney veut mettre à jour la communauté des affaires sur les progrès de la proposition de l’Oléoduc Énergie Est. Cette annonce arrive seulement deux semaines après que la population a appris que TransCanada avait fait parvenir une lettre à la Ville de Fredericton pour refuser la requête du Conseil de la ville d’organiser une rencontre publique pour ses citoyens. Dans une lettre du 11 février 2015, Patrick Lacroix, gérant du projet de TransCanada Énergie-Est, expliquait la position de sa compagnie : « Nous demeurons concentrés sur les collectivités et les propriétaires directement affectés par l’itinéraire de l’oléoduc, » laissant entendre que Fredericton ne serait pas directement affecté par l’oléoduc. La lettre de TransCanada ne mentionne pas que la compagnie a participé à des rencontres avec la communauté des affaires de Fredericton. Philippe Cannon de TransCanada a fait une présentation sur la sécurité publique et les impacts économiques de l’oléoduc proposé à la Chambre de commerce de Fredericton, au Club Rotary de Fredericton Nord et au maire Brad Woodside le 17 mars 2014. « La question que nous posons à TransCanada est très simple : « Où aboutira un déversement dans la Nashwaak? » affirme madame Connell. « Va-t-on préparer une modélisation informatique pour prédire si oui ou non des produits toxiques provenant d’un déversement de pétrole atteindra l’aval de la Nashwaak, l’endroit critique d’ouvertures vers l’aquifère de Fredericton? Elizabeth Hamilton, membre du chapitre de Fredericton du Conseil des Canadiens résume pourquoi son groupe est si préoccupé à propos de cet oléoduc. Une étude indépendante commandée par une municipalité du Québec a trouvé que des déversements d’Énergie Est aussi importants que 2,6 millions de litres par jour peuvent passer inaperçus. Et le bitume dilué que TransCanada prévoit pomper dans cet oléoduc est rempli de produits chimiques cancérogènes et coule immédiatement au fond des cours d’eau. Tickets are $25 in advance or $30 at the door. You can buy tickets online here, at the Dolma Food stores in Moncton and Dieppe, or by contacting Anita atccnbsoutheast@gmail.com or 506-859-8104. The 100-Mile Dinner gathers friends, neighbours and community members to celebrate with a locally-sourced tapas buffet (including vegetarian options), guest speakers, a live auction, draw prizes, and presentation of the third annual Beth McLaughlin Environmental Journalism Award. If you have items you’d like to donate to the auction, please contact Anita atccnbsoutheast@gmail.com or Dave at 506-859-8104. Seating is limited so get your tickets today! 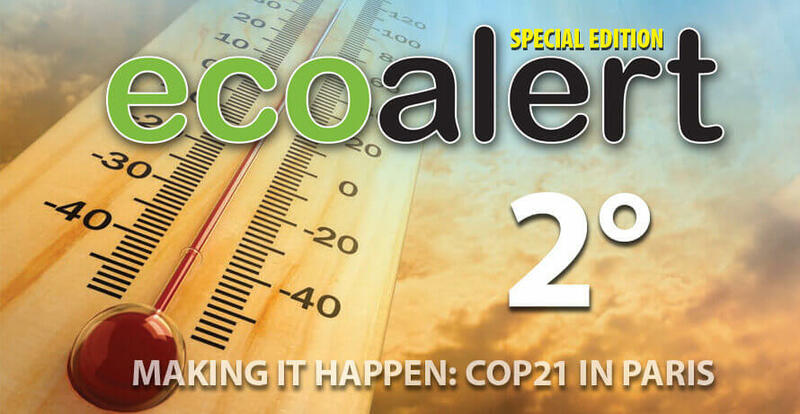 The Conservation Council of New Brunswick has released a new special edition of its membership magazine,EcoAlert: <2° — Making it Happen at COP21 in Paris. This special edition will help you cut through the jargon and technicalities of international climate negotiations to understand:What the heck is COP21 in Paris? What’s it all about? What does the fight against climate change mean for me, our province, and Canada as a whole? Click here to download a PDF version of this issue, or head toour archives for past editions. Please write a letter to your MLAand help us collect many signatures to our petition. Letters and petitions (hard copy originals only, no copies) must be returned to 180 Saint John St., Fredericton, NB E3B 4A9 by April 2. (FREDERICTON) -- Getting ready for beach time in New Brunswick? Before you go, download the brand-new version of the Swim Guide app. With over a million users worldwide, the popular (and free!) application gives beachgoers access to the latest water quality monitoring results for their favourite beaches, along with descriptions, photos, and directions. The 2017 update means Swim Guide is now available in French, English and Spanish. It includes information for over 7,000 beaches in Canada, the United States, Mexico and New Zealand, and has individual entries for over two dozen New Brunswick beaches. What’s in it and Why is it Helpful? Swim Guide lets people browse the map or search for a beach by name. Each beach has a description that list amenities, informs you about lifeguards, provides tips about where to park and other valuable information. If you don’t know your way to the beach, don’t worry, the app also provides directions whether you’re walking, cycling, driving, or taking transit. Every beach in Swim Guide is marked with an icon that easily lets you know if the water quality is safe for swimming. The water quality data for NB destinations comes from the Department of Environment and Local Government’s website, and is uploaded to Swim Guide by the Conservation Council. Each beach has a “Source” section which details how the data was obtained. Swim Guide was developed by Swim Drink Fish Canada (previously a project of Lake Ontario Waterkeeper), a non-profit organization based in Toronto, with the goal to ensure that 100 per cent of Canadians have access to basic data about the health of their watersheds. The group just released the first-ever Canada Beach Report, which was created in collaboration with Waterkeepers, Riverkeepers and Baykeepers across Canada, including the Conservation Council. Learn more about Swim Guide online at www.swimguide.org. Read more about the first-ever Canada Beach Report, here. Read “A treasure too valuable to waste-our shorelines” by Conservation Council’s Lois Corbett. Want to check it out for yourself? Download the iOS version for your Apple product or the Android app for your smartphone. To arrange an interview, contact: Corey Robichaud, Communications Officer, corey.robichaud@conservationcouncil.ca, 506-458-8747.